No longer balance or bend down to wash your feet. This sandal washer allows you to scrub your feet with very little effort and with all the benefits. 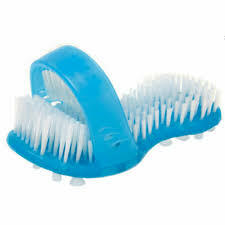 The many bristles give you a thorough foot scrub all in one step. Get all the benefits of a spa treatment but from the convenience of your own home. The bottom of the sandal features suction cups that affix to the ground of the shower or tub surface. That means that you can use it while you sit in the shower or lay down in the bathtub. For those who have trouble bending or balancing, this scrubber is perfect as it requires little effort to use as one gently scrubs, massages and stimulate the feet. Soft, high-quality bristles clean your feet. Simple to use as one just needs to move their feet back and forth and they can enjoy a fantastic foot scrub. Many who are disabled or have trouble with bending or balancing can find it difficult to clean their feet. This sandal washer seems like the perfect solution. Not only is it small and can be packed into any suitcase or bag, it can also be used in any shower or bathtub so you can take it to the gym or or anywhere with public showers.